8x8 supports Hot Desking. With Hot Desking, you can turn a device into a shared desk phone and allow other users to use it as their own, but during different time periods. A primary motivation for Hot Desking is cost reduction through space savings. Hot Desking is often found in workplaces with flexible schedules for employees, where not all employees are actually working in an office at the same time or on the same schedules. Employees in such workplaces use existing offices only occasionally or for short periods of time, which leaves offices vacant. By sharing such offices, employees make more efficient use of company space and resources. Ability to turn any user's device with a proper license to Hot Desk. Ability to log in to a shared phone that immediately behaves like your own extension. Ability to make and receive calls on the Hot Desk. Ability to check messages on the Hot Desk. Providing a more personalized, secure, and convenient phone experience whether traveling to other offices or working a shift at a shared desk. The Hot Desk user is not able to use Virtual Office desktop app or Virtual Office mobile app. 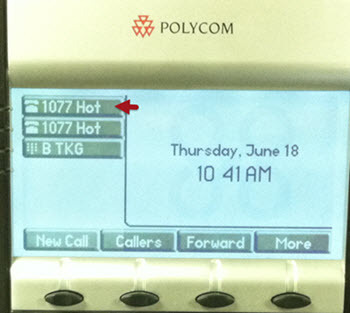 Turning on Hot Desk capabilities for a device prevents the primary user from making or receiving calls. Only the user logged in as a guest on the device is able to make and receive calls. Multi-port devices such as DECT base or ATA terminal unit. Devices that use the shared line appearances in line key configuration. Let's say AcmeJets sales employee needs an office for a client meeting but does not otherwise have need of a personal office. A permanent sales work station can be made available to any worker when needed, with employees sharing the station as needed. Another example is when employees need to perform specific tasks at work stations created for those tasks in a test lab. The individual work stations are not set up as personal offices. How to Use Hot Desk? Only users with the appropriate license permissions (X6 or higher) can be BMW admins.